The Herculean efforts, dangers and triumphs that brought the Brooklyn Bridge to life are well-known. But now, “In the Shadow of Genius: The Brooklyn Bridge and its Creators,” a deeply personal and meticulously researched history, photographer and longtime Seaport resident Barbara Mensch has brought a fresh and insightful look at this grand span. Her enchantment with the bridge only grew once she started delving into the lives of those who engineered it: German immigrant John A. Roebling, his son Washington and Washington’s wife Emily. Mensch seamlessly blends her own experiences with the bridge with her discoveries in the archives at Rutgers University, discoveries that led the photographer on a journey to the formative places in Roebling's life: from his birthplace, Mühlhausen, Germany, to the Pennsylvania town of Saxonburg, where in 1831 he established a utopian community, to the aqueducts and bridges of his design in Pennsylvania, Ohio, and New York. John Roebling was undoubtedly a visionary genius who not only pioneered the design of suspension bridges, but also the inventor of a revolutionary way to manufacture wire ropes, without which the Brooklyn Bridge would not have left the drawing board. He even dreamed of building a bridge over the English Channel. But he was a difficult man who bullied his wife and children. By Mensch’s account, he almost killed his family with wacky experiments with nutrition and an unwavering belief in the power of water to cure anything. Mensch quotes his son Washington’s unvarnished description of his father: “His domestic life can be summed up in a few words—domineering tyranny only varied by outbursts of uncontrollable ferocity.” Mensch includes some dour photographs of John and clearly finds him an unpleasant if formidable figure. His long-suffering wife Emily, who would take over the day-to-day project management of the bridge after her husband fell ill, also performed the important role of archivist, diligently creating scrapbooks of every article and document about the bridge. In the end, Mensch tells us, her death before her husband was blamed partly on overwork. While Mensch’s account of the bridge’s roots is eminently readable and full of carefully sourced historical nuggets, I found her own relationship with the bridge even more beguiling. Whether by stealth or the city’s permission, she has explored the nether regions of the bridge. Huge spaces exist under the arches on the Manhattan side that were used until the 1970s for a range of businesses including wine storage and a tanning factory. On one occasion, she nearly gets locked into the under shafts for a weekend. Mensch’s photographs of these dark and forgotten spaces are eerie and beautiful. 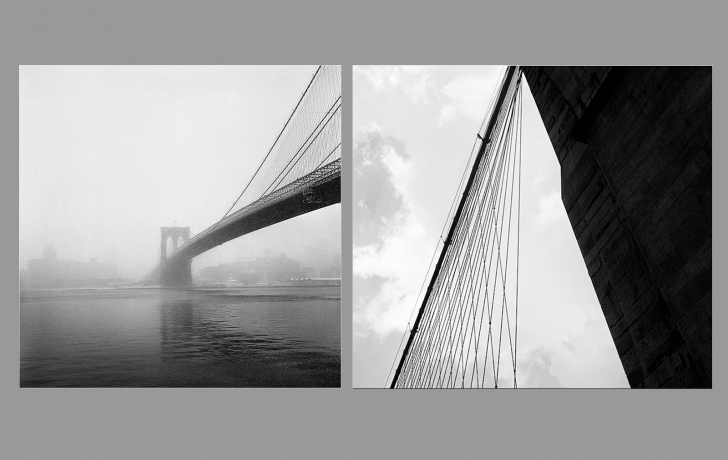 The last section of the book is a series of Mensch's photographs of the bridge from unexpected angles. The shots capture the bridge’s grandeur and mystery—especially in one breathtaking image of the bridge shrouded in fog. Such photos, much like Mensch’s ambitious work as a whole, will lead you to view the magnificent span in a fresh and even more alluring way. Barbara Mensch will give a book talk at The Skyscraper Museum, 39 Battery Pl., on October 29. Information here.